The study of dynamics, the movement of objects in space under the influence of each other's gravity, gets more complicated the more objects you throw into your system. At this year’s Division for Planetary Sciences/European Planetary Science Congress meeting, the Exoplanet Dynamics session was packed full of talks on tightly-packed multi-planet systems and their instabilities. 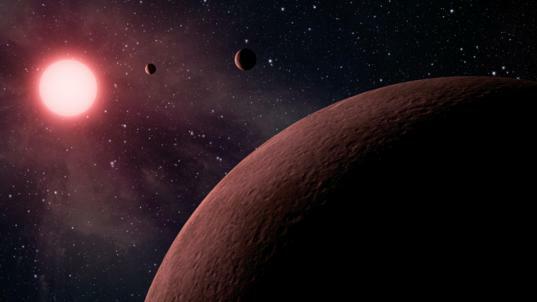 Four talks concerned the type of planetary system discovered by the Kepler mission in which three or more exoplanets orbit very closely to one another, known as tightly-packed multi-planet systems. Kepler has discovered over 200 multi-planet systems, enough for us to start comparing these systems to find patterns and trends. For example, Sakhee Bhure looked closely at the relationship between an exoplanet’s radius and its location in such a system. She found that smaller planets tend to be found at the outer edges of these systems, while larger planets cluster towards the middle. Darin Ragozzine, on the other hand, was interested in how many of these systems have planets in resonances. Two planets are said to be in a “resonance” if the ratio of their orbital periods is an integer ratio. For example, Pluto and Neptune are in a resonance because Neptune orbits the Sun three times for every two orbits that Pluto completes. Ragozzine calculated the orbital period ratios of planets in Kepler’s multi-planet systems and found that while there is a large range of possible period ratios, there seem to be a lot of planets very close to resonances. He also found that planets near a resonance with each other tend to have unusually low relative orbital inclinations: their orbits are not significantly tilted relative to each other. Ragozzine suggested that planets can form with any period ratio, and in systems with planets that happen to form near resonances, some process acts to decrease their relative inclinations. Two presentations discussed the stability of planets in these tightly-packed systems. Planets that orbit too closely to one another can become unstable and eventually be unceremoniously ejected from the system. In systems with more than one planet, it’s hard to predict whether a planet will be ejected, and how long after the system’s formation this will happen. 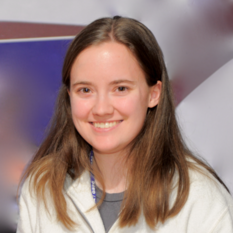 Christa Van Laerhoven used orbital simulations to track the evolution of different types of tightly-packed multi-planet systems and measure when they become unstable. She found that the farther apart the planets are, the longer the system will last before becoming unstable, although this result depends strongly on whether the planets are in resonance with each other (which can make them more stable or unstable). For fun, Van Laerhoven also calculated that five Earth-mass planets could fit in the habitable zone of a single star system without becoming unstable for at least ten billion orbits. Dan Tamayo also studies the stability of tightly-packed multi-planet systems, but he wondered whether there was a faster way to predict whether a system is stable or unstable for a given period of time. Orbital simulations take a long time to run, so a faster method would let researchers compare the stability of many different systems in a shorter period of time. Tamayo tried applying machine learning to this problem, a technique that’s just starting to become popular in data-heavy fields like astronomy. After running many orbital simulations of tightly-packed systems, Tamayo used the results to train the algorithm to estimate the probability that a system is stable, without having to run a new orbital simulation. The algorithm works 1000 times faster than an orbital simulation, and can make very accurate predictions. Jack Lissauer also talked about orbital stability, but for a much more well-known system: Alpha Centauri. The third and smallest star in the system, Proxima Centauri, has been in the news recently due to its recently-discovered planet, but Lissauer considered the possibility of a planet orbiting the other two stars in the system, Alpha Centauri A and Alpha Centauri B, which orbit each other very closely. Lissauer mapped out where a planet on a stable orbit could be found in the sky around Alpha Cen A and B, to help observers on Earth know where to look for another planet. He also found that stable orbits around Alpha Cen A and B can overlap with their estimated habitable zones, leaving open the possibility that a habitable planet may be found orbiting these two stars. One consequence of an instability causing an ejection in a system is that the ejected planet ends up flying through the space between stars as a free-floating exoplanet. Tom Barclay showed results from his simulations of ejections to predict what kinds of free-floating rocky planets we might expect to find with missions like WFIRST. He found that if there are gas giants in the system, planets up to the mass of Mars can be ejected. Gas giants can eject more than a Mars’ worth of material, but the ejections happen so early in a system’s history that larger rocky planets haven’t had time to form. Barclay’s models don’t show any ejections of Earth-mass planets, because Earths haven’t formed by the time the gas giants are ejecting their smaller neighbors. He predicts that any free-floating rocky planets found by WFIRST will be Mars-mass or smaller. Two talks in this session examined the effects of a planet’s gravity not on other planets in the system, but on the system’s debris disk, the icy and rocky material leftover from planet formation. Paul Weigert presented his student Maryam Tabeshian’s models of a planet opening a gap in a debris disk. They showed that the size and shape of a gap will change depending on whether the planet is orbiting interior or exterior to the disk. By measuring the shape of a gap in an observed disks, astronomers could predict where an unseen exoplanet might be found. In my own presentation, I discussed the case of HD 106906, a star with an 11 Jupiter-mass companion on an extremely distant orbit outside a debris disk. My simulations of the shape of the disk can help us constrain the orbit of this distant companion. Johnathon Ahlers’ talk concerned the deceivingly simple case of one planet orbiting a star. Planet formation models predict that the axis of the star’s rotation should line up with the axis of the planet’s orbit. However, the orbits of some planets are misaligned with their stars’ spin axes, a finding that is especially common in systems with hotter, more massive stars. Researchers need more data about these systems to develop good models to understand this result, but measuring the spin axis of a more massive star is tricky. These stars tend to rotate faster and show a lot of variation in their brightness, which causes a lot of noise in observations. Ahlers proposed a new method to measure the spin-orbit misalignment in massive stars using techniques from astroseismology, which could be used on Kepler data to provide more information for modelers.